The church that we go to is one that holds some very special memories for us as a family. It was the church that my hubby was christened in, grew up in and was part of Boys’ Brigade company. When I moved to the area, it made sense to me to go there too. I already knew some of the people and I was made to feel incredibly welcome. Four years after I moved to the area, hubby and I got married there. I always imagined that our children would be christened there. As is often the way with life though, things don’t always turn out quite as you imagine! Jessica’s christening took place not in the church as I had originally imagined, but in the room where I had given birth to her just a few minutes earlier. 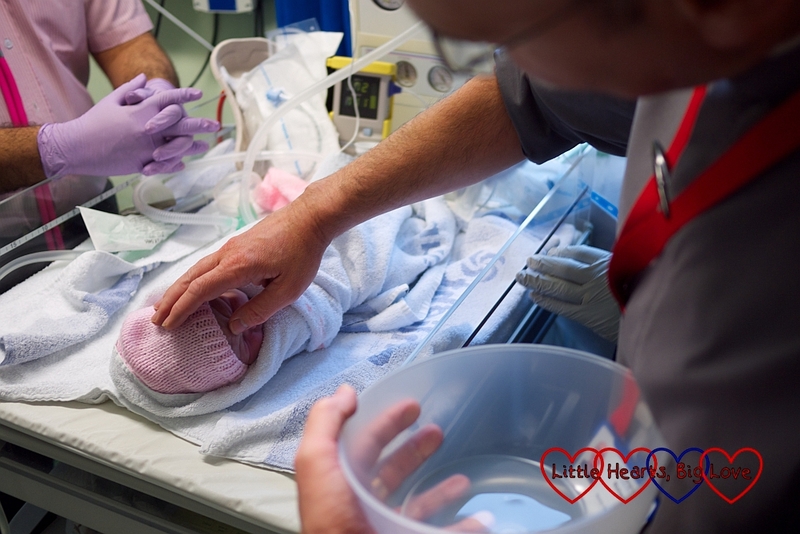 Her heart condition made her chances of survival small and her first open heart surgery needed to take place as soon as possible. Because of this, I made it clear on my birth plan that we wanted Jessica to be baptised as soon as possible. 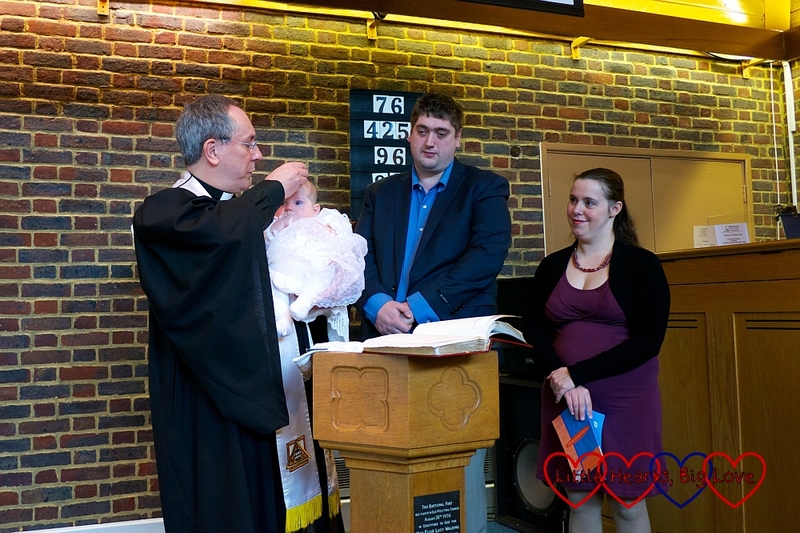 I only vaguely remember the moment that she was baptised. Hubby took a few photos for me. I do remember how nice and friendly the chaplain was though. Once we were home with her though, we had a celebration at church to welcome her into the church family. This was essentially a christening service with the baptism omitted. 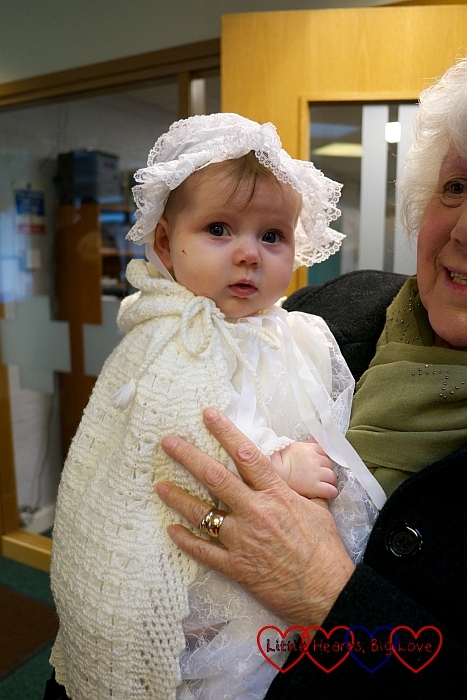 My mum had bought Jessica a pretty little white dress and she was wrapped in a shawl which hubby’s great-grandmother had made for his christening. We felt like the proudest parents in the world that day, giving thanks for the life of our miracle daughter. She was welcomed into the church family that had supported us with their love and prayers since we had found out about her heart condition at the 20 week scan. Sophie’s christening was more like what we’d anticipated. It took place in our church with the same minister who’d welcomed Jessica into the church family. My original plan had been for her to wear the dress that Jessica had worn for her welcoming service. However, as Sophie was a bigger baby, it was too small for her. Before I could go shopping for a christening dress though, I came across a bag whilst sorting out boxes in the garage. 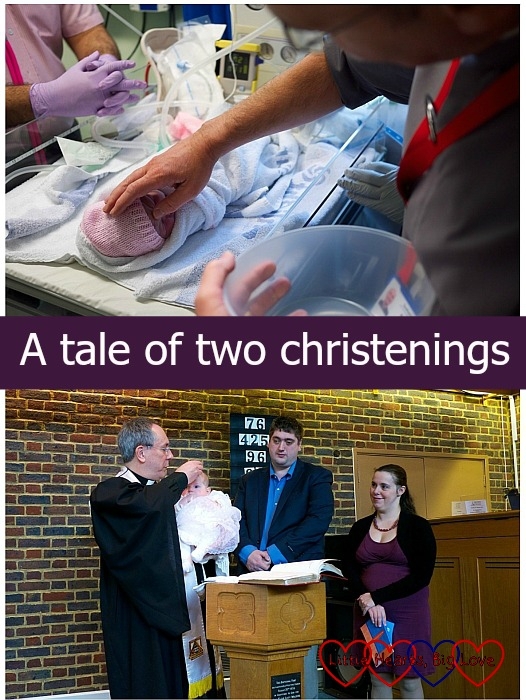 The bag contained three christening gowns. Two of them belonged to myself and my twin and the other was my dad’s 80-year old christening gown. 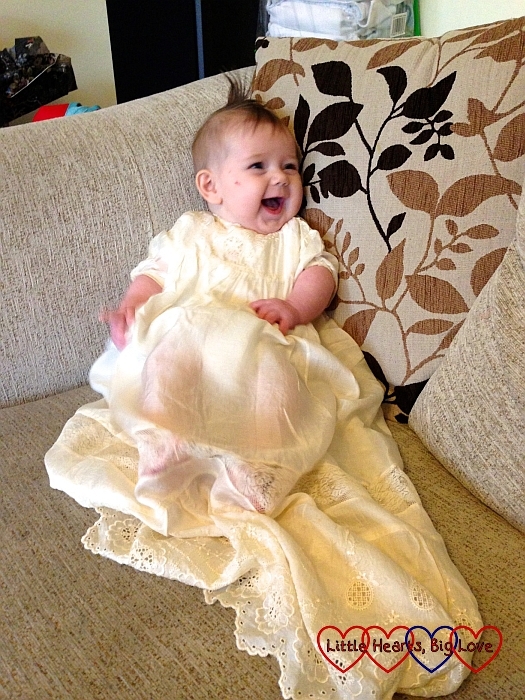 I would have loved for Sophie to have been christened in her granddad’s christening gown. I didn’t want to risk damaging it by having it cleaned though. The short sleeves were also not ideal for a February christening. I took a photo of Sophie wearing it but decided that she would wear my christening gown and bonnet instead and her daddy’s christening shawl. 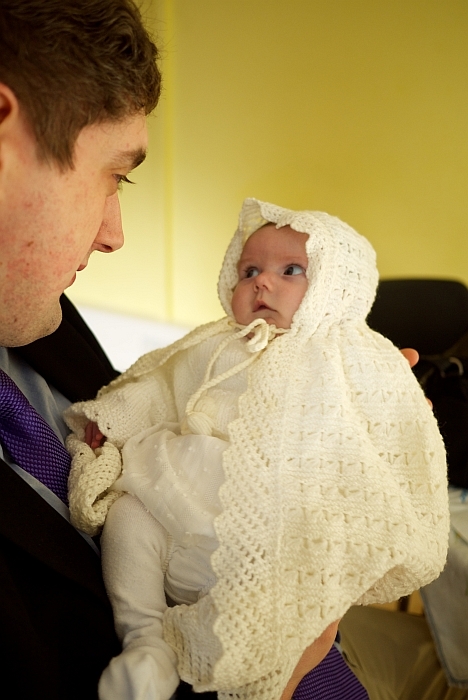 Having her dressed in something from both our christenings felt so special. 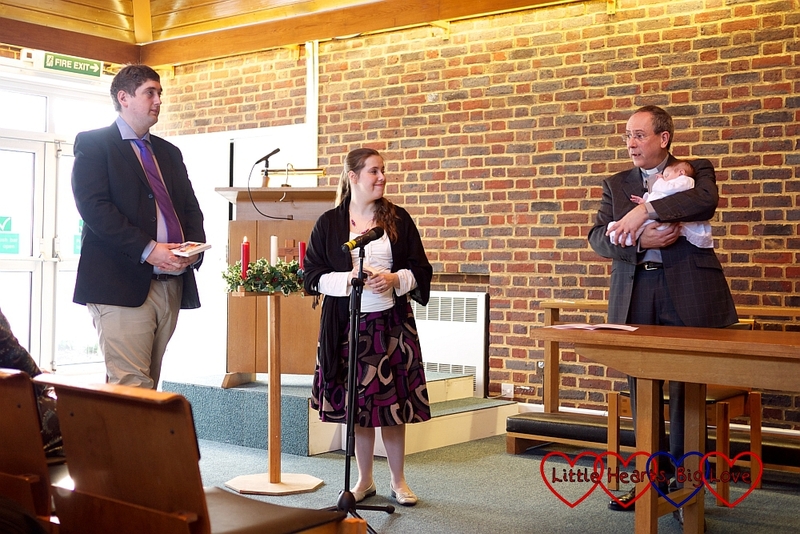 As with Jessica’s welcoming service, we were very proud parents that day! Both our girls have the same four godparents. Although Jessica wasn’t actually baptised at our church, her name is still on the cradle roll with Sophie’s. They are both very much a part of our church family and are very confident and happy in that environment. Both of them usually make a beeline for the toy area as soon as they walk in the door! They are the fourth generation of hubby’s family to be a part of the church. It is wonderful to see how comfortable they both are at church and how they have very much been welcomed into the church family. Thank you – I’m sure everything that was going on was quite startling for her – there were so many people surrounding her at that point! You have beautiful little girls. I think it’s lovely that so many generations have used the same church and that it has such significance to you.